Having gray or white hair is nothing to be ashamed of. In fact, gray hair is gorgeous! However, we understand that some folks might not be ready to give up their dark locks yet. That's why we created the Instant Gray Hair Remover stick! This stick is perfect for touching up your roots. It's affordable, non-toxic, and very easy to apply. Plus, you can take it with you wherever you go. How convenient! You'll love our hypoallergenic formula. Convenient - An affordable way to dye your roots without expensive, time-consuming appointments and treatments. Time Saving - Covers up gray hair in a matter of minutes! 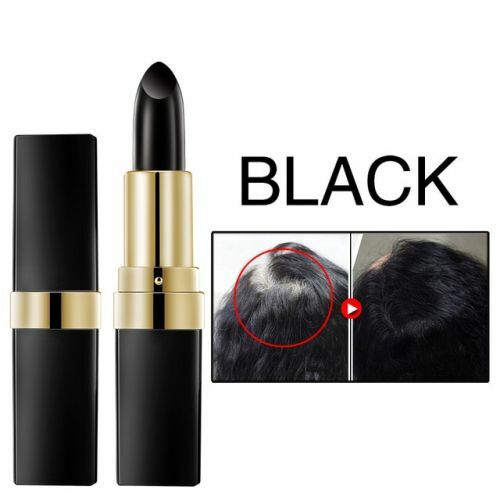 Compact - The lipstick design mechanism of this hair dye fits in your purse, backpack, desk, anywhere! Take it with you on vacation or to the office! Hypoallergenic - Our touch-up stick is made from non-toxic ingredients that are derived from plants. They are not harsh like other dye kits. Easy To Apply - All you have to do is apply the product to dry hair, wait for one minute, and that's it! Using a blow dryer may speed the absorption process up a bit. Non-permanent - No worries! Our product washes right out of your hair when you shampoo.